Innisfree Irish perfume is a beautiful representation of Ireland and it encapsulates and mirrors the unique emotional experience that is in the W.B. Yeats poem The Lake Isle of Innisfree. A copy of the poem is found inside the carton. 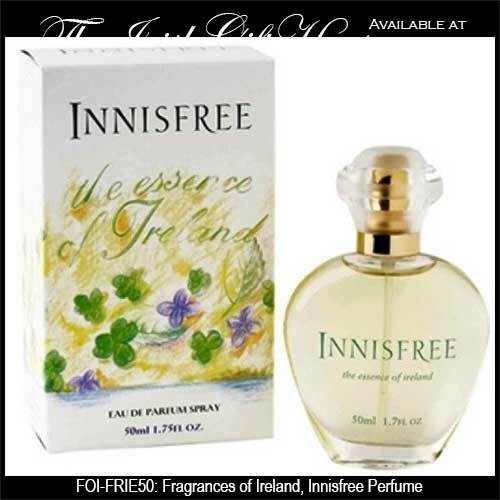 Innisfree Irish perfume is an Eau de Parfum and it comes in a 50ml (1.7 ounce) spray bottle. The overall effect of the Innisfree fragrance is lightness, freshness and youthful zest which develops into a classically elegant and very rich woody floral perfume of great depth and transparency. There can be no better evocation of all the softness, greenness and richness which compose Ireland. Innisfree perfume is a celebration of femininity, nature and Ireland and it is made in Ireland by The Fragrances of Ireland.